Republicans have continuously attempted to describe America as a Center Right country. Unfortunately most of the media have bought into this fallacy as well. This false sense of reality has consequences. It skews the daily news narrative and with that legislation. Why are Republicans driving that narrative? It has everything to do with human psychology. Peer pressure tend to make people do things they know isnt right. It makes them at times even vote against their own interest or support detrimental policies because they think if most people are supporting those policies, they must get on that bandwagon. It is the action of the herd, the herd mentality. So how can Republicans say the country is Center Right with a straight face? According to a Gallup poll, 40% of Americans are self-described Conservatives, 35% Moderate, and 21% Liberal. Those numbers do seem to say Center Right. But how did that really happen? It is simple. The GOP had an all-out assault on the word Liberal and only the most mentally strong will admit in any poll to be Liberal. What is important is not what people say they are, but to analyze what they believe in. Read the article America Is A Center Left Country While American Voters Are Center Right. The fact that Americans love their government provided entitlements like Social Security, Medicare, Unemployment Compensation, and Educational Financial Aid is proof positive. The fact that Americans are rather sexually liberated is proof positive. The fact that Americans support liberal social policies like gay marriage, single parent adoption, gays in the military, etc. is proof positive. One could go on and on. Americans, even with their vote have shown an inclination to vote Liberal. After all, Democrats won the popular vote 5 out of the last six elections by substantial margins. 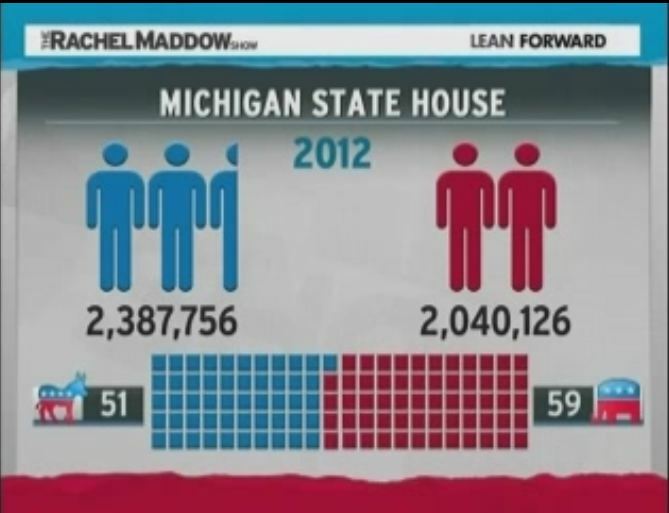 See Rachel Maddow Video Here condensed to 90 seconds. What is sad is that over the years, Republicans have been undemocratically using the demographic maps to cluster Democratic voters in such a manner that Republicans are vastly overrepresented in both State Houses and Congress. This is political theft. For all those that believe in the infallibility of the US Constitution, this should be a wakeup call. Republicans are not doing anything illegal. They are simply using yet another defect in the constitution to ensure its original intent, that only a select few are entitled to have their vote counted.